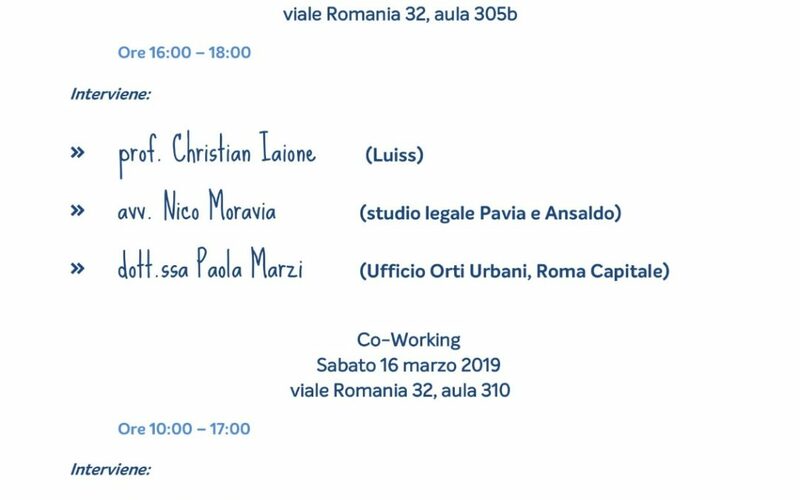 The third workshop of the Urban Clinic EDU@LabGov 2019 took place on Friday the 15th of March into the Viale Romania Campus of LUISS University. The workshop has inaugurated the start of the third module of the course. The module was dedicated to “Urban Law and Policy”. Indeed, the Laboratory hosted three important experts on these themes: prof. Christian Fernando Iaione, lawyer Nico Moravia, and dr. Paola Marzi. Prof. Iaione, the scientific co-director of LabGov, teaches Urban Law and Policy and Urbanistic Law at LUISS University. Lawyer Moravia is partner of the law firm Pavia-Ansaldo (administrative law department). Dr. Paola Marzi is an official of the municipality of Rome as Head of the office for the Urban Gardens, and has a long experience on these themes since she has participated in the drafting of the Regulation of Urban Gardens of Rome. The workshop was introduced by the speech of Prof. Iaione, who talked about his experiences in the urban regeneration field. He exposed the project of Co-Bologna (http://co-bologna.it/): the program started 7 years ago and its effects were such as to spread his principles in Italian cities like Turin, Rome and Reggio-Emilia, but also in others parts of the world like New York, Amsterdam and Sao Paulo. All these experiences demonstrated how important is to rewrite administrative and urbanistic legislation in order to face all the problems brought in the cities by the changes of the third millennium. What is fundamental in this process is the participative paradigm, that means involving as much as possible all the different urban stakeholder in order to re-define the way of living the urban centers. Indeed, lawyer Moravia showed how it worked in the roman context, by showing the case of the Ex-Dogana: an un-used space, owned by Cassa Depositi e Prestiti, brought back to life by the efforts of four young entrepreneurs. The cohesion of legal, human and economics competences, made possible to find a new and simple solution, like a temporary leasing contract, and create what now is one of the most important experiences of this kind in Rome. One of the sectors where the participative paradigm is more successful and better applied is the urban garden’s one. Dr. Marzi explained how gardens are the place where it is possible to focus all the energies and differences of a neighborhood, not only as a place where plants grow, but as an instrument of social inclusion, that generates wellness and new solutions to co-live the city by building up new forms of community. 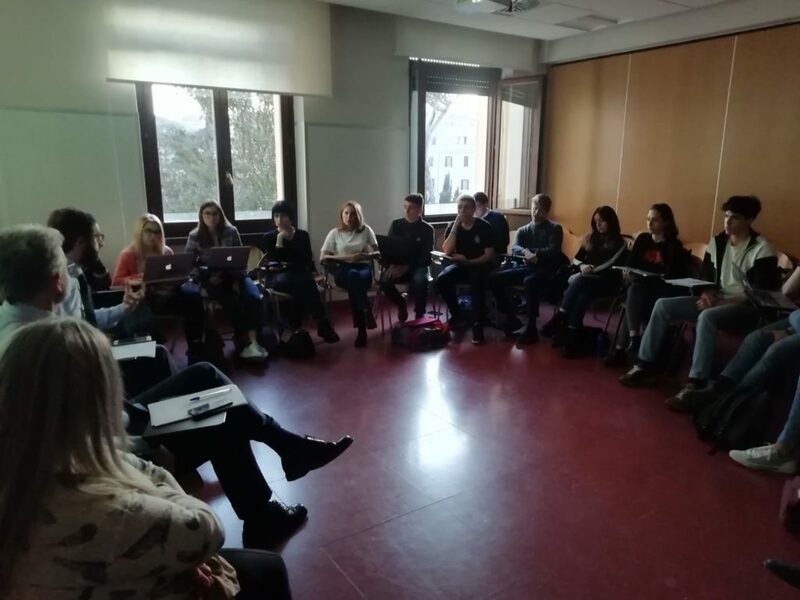 The 3rd Module of the Urban Clinic LabGov EDU 2019 continued with the Co-Working session, held on March 16th. The co-working session is facilitated by Chiara De Angelis, Friends of LabGov’s ex-president. 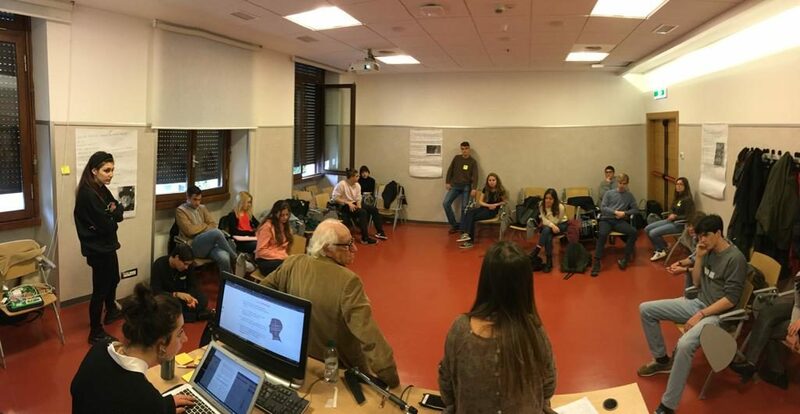 The Co-Working session took place in the LUISS Campus of Viale Romania and it started at 10 am with Pasquale Tedesco’s testimony, expert of Confagricoltura (http://www.confagricoltura.it/ita/). He talked about the importance of the relationship between Earth and Nature and the fortune to enjoy some products that Earth offers. After this inspirational session, Chiara De Angelis explained the Labgovers service design, an important passage to complete and improve the idea that they’re developing during this A.A. of LabGov EDU. For this reason, the LabGovers were divided into groups in order to select the “personas” (consumer type) of their product/service, basing on their previous research. In the afternoon, the LabGovers developed the user journey map to describe the possible experience consumers might have through the platform that they are developing. 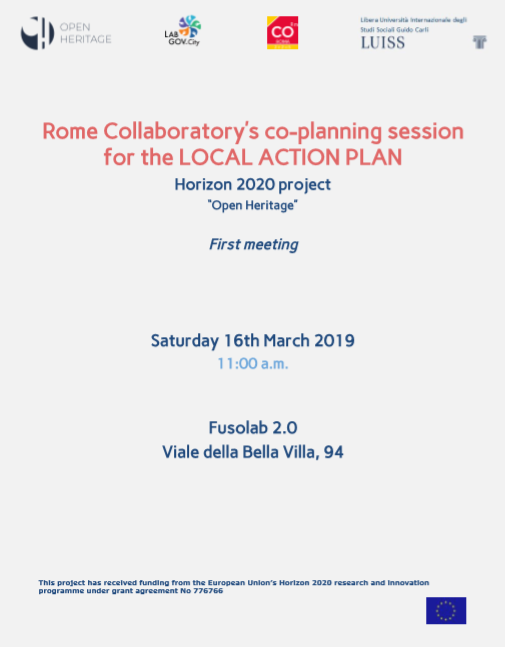 Launch of the incubation process of the Local Action Plan (LAP) of the Rome Collaboratory within the Open Heritage project. 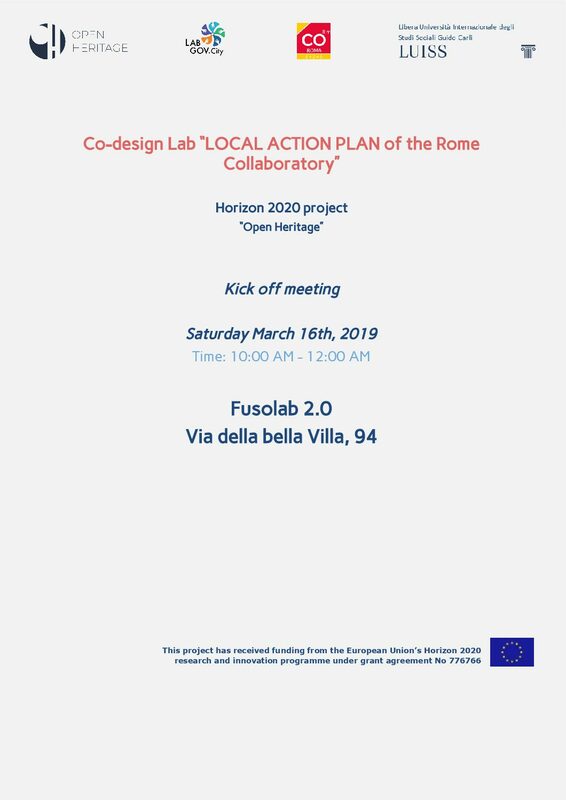 On Saturday March 16th from 11:00 a.m. to 13 AM at the community hub of the Alessandrino neighborhood Fusolab, the incubation process of the “Local Action Plan of the Collaboratory of Rome” officially started. The activity represents a key stage of the Horizon2020 OpenHeritage.eu project which investigates and experiments economically sustainable and inclusive governance models of tangible and intangible cultural heritage in cities. The Local Action Plan (hereinafter: LAP) defines the mission and strategy; activities; business plan of the Rome Collaboratory, one of the six “Cooperative Heritage Labs” of the Open Heritage project, where socially and economically sustainable models of cultural heritage reuse will be designed and tested. Coordinated and facilitated by the LUISS LabGov team, the meeting (which was open to all stakeholders in the Alessandrino-Centocelle-Torre Spaccata district willing and motivated to participate) was aimed at defining the mission, objectives and strategies of the “Local Action Plan”, as well as creating a shared agenda to structure its activities, starting in June 2019. The meeting participants were a wide range of district’s stakeholders: local NGOs; commercial actors active in the Centocelle heritage area; founding members of the neighborhood cooperative and recognized FARO heritage community incubated by LUISS in previous years, CooperACTiva; representatives of LegaCoop; city inhabitants interested in the project. The LUISS LabGov team introduced the Open Heritage project and the Rome Collaboratory’s goals and specific objectives to the meeting’s participants. The meeting then entered into the part where the organization and structure of the incubation process is defined. 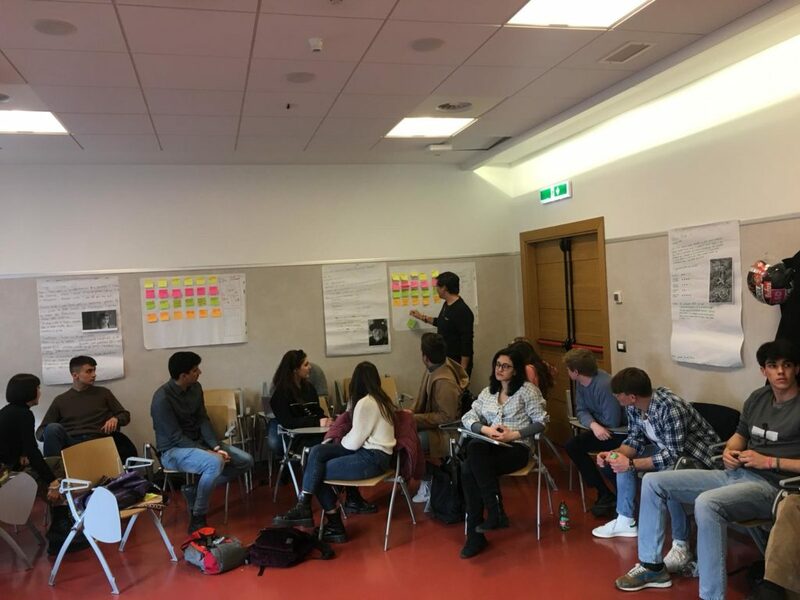 The LUISS LabGov team shared the proposed timeline of the process and the participants integrated and refined it on the basis of their availabilities. 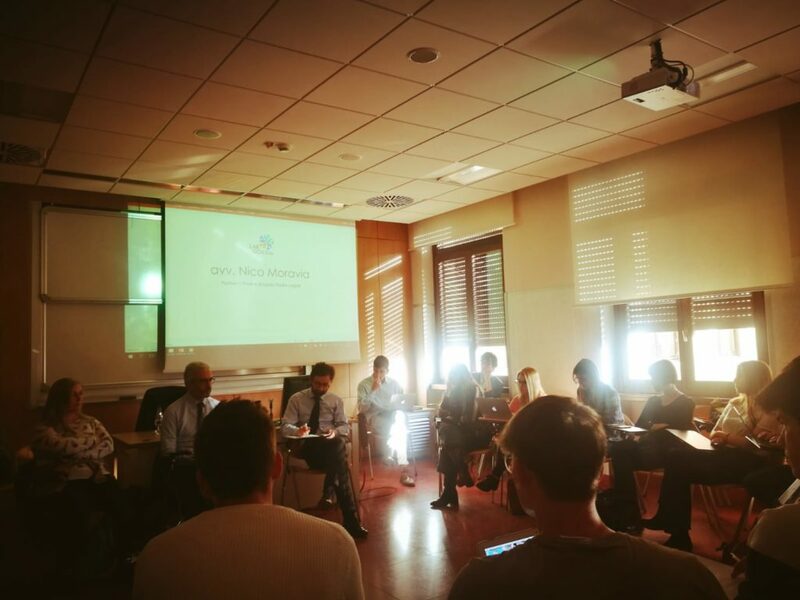 They meeting then proceeded with a co-working session focused on the creation of internal working groups within the participants, according to the activities that will be implemented in the Rome Collaboratory. The meeting concluded with the participants taking the commitment of investing efforts in the following week to engage more district actors that they have relationship with into the LAP incubation process. The next meeting is organized for the following week and will focus specifically on the co-design of the LAP’s specific activities and the stakeholders’ outreach and engaging strategy.